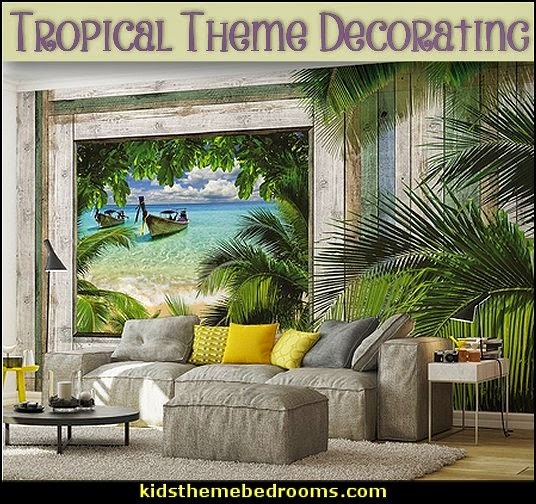 Ever dreamt of living in the tropics? 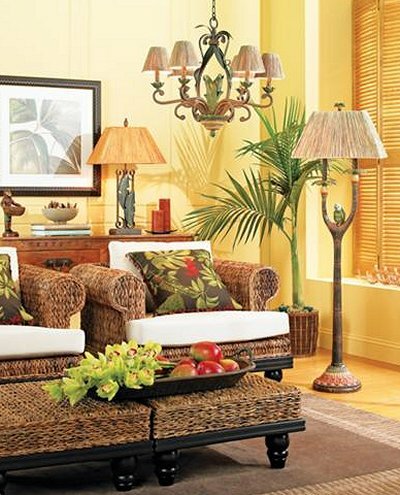 Natural textures and leafy greens create a warm and inviting coastal interior. 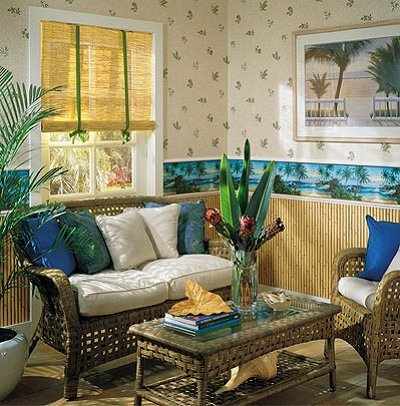 Wicker, rattan, and bamboo mingle together nicelty to create a calm and inviting coastal interior. 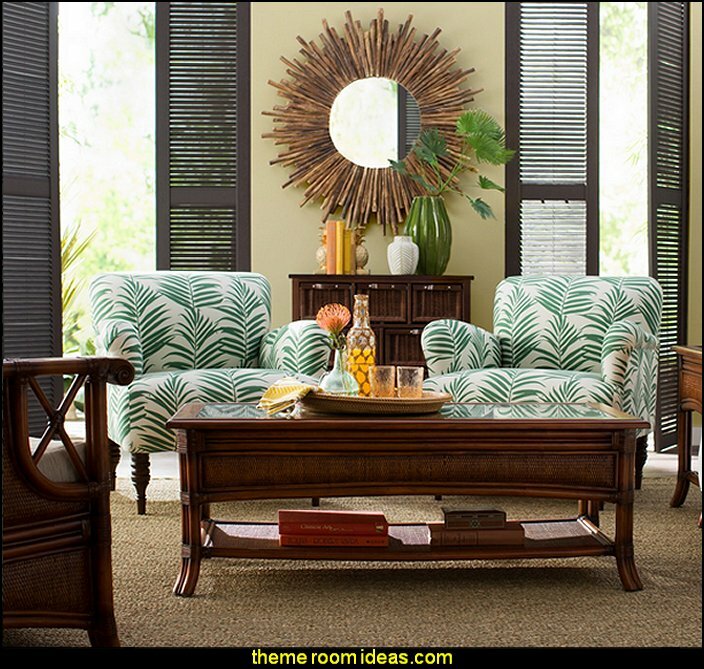 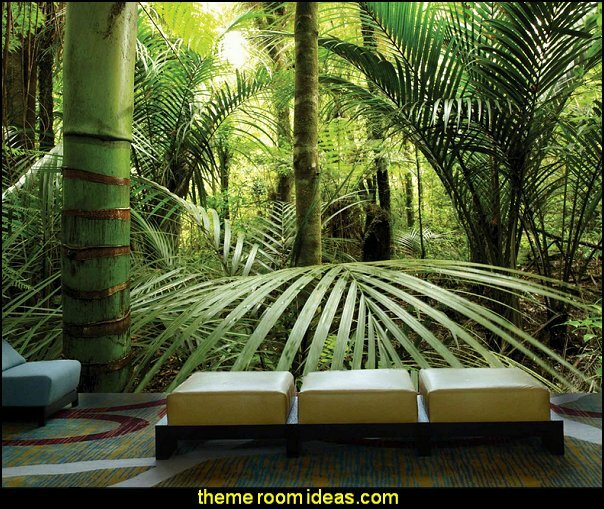 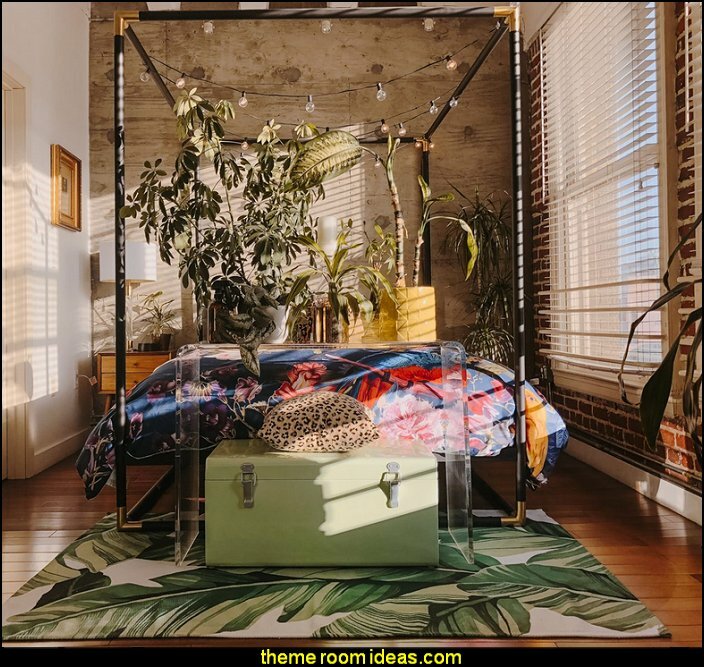 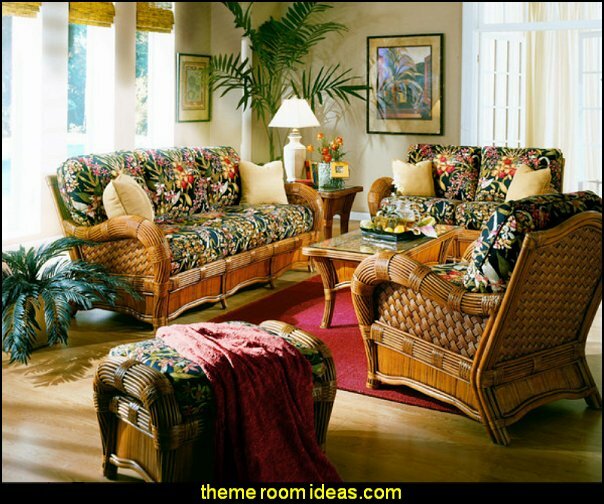 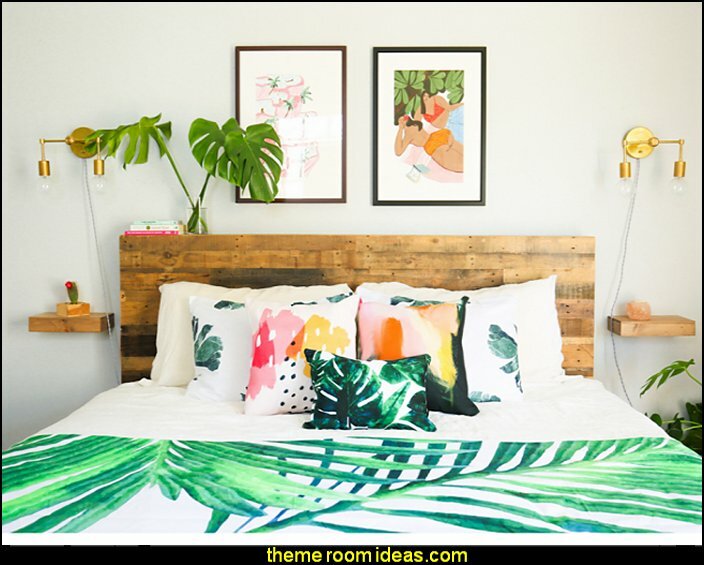 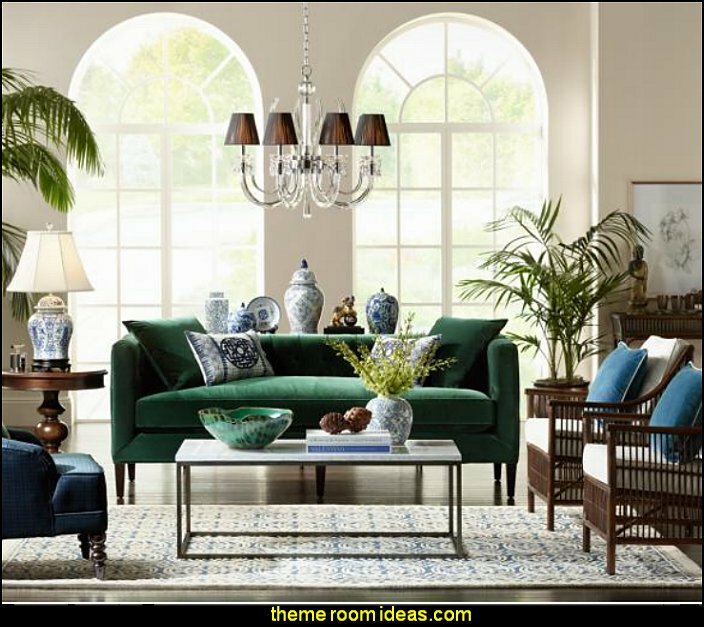 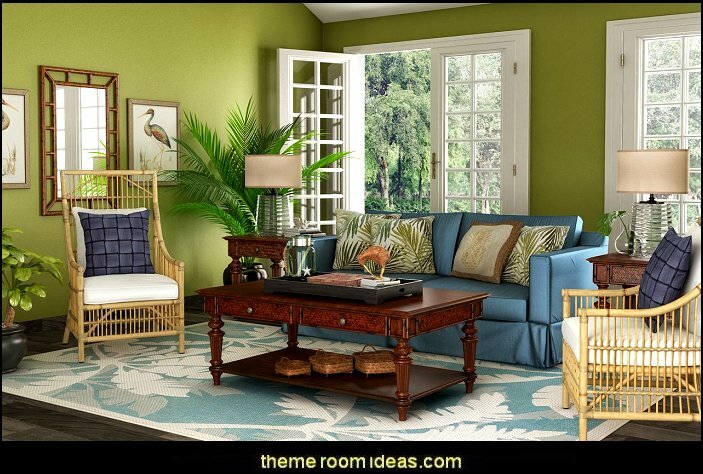 Accented with green ferns, - both in print on bedding, pillows, walls, and as a potted plant in the corner, mixed with sunny colors and your space will have a tropical vibe that just begs to be relaxed in. 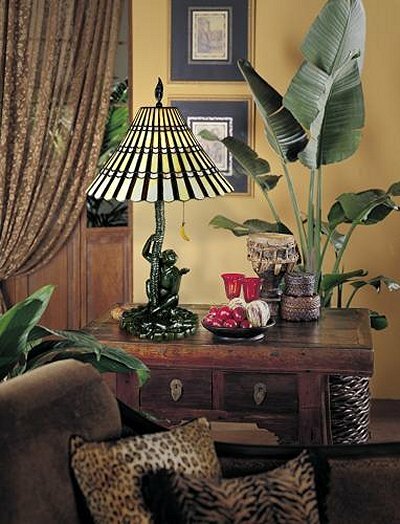 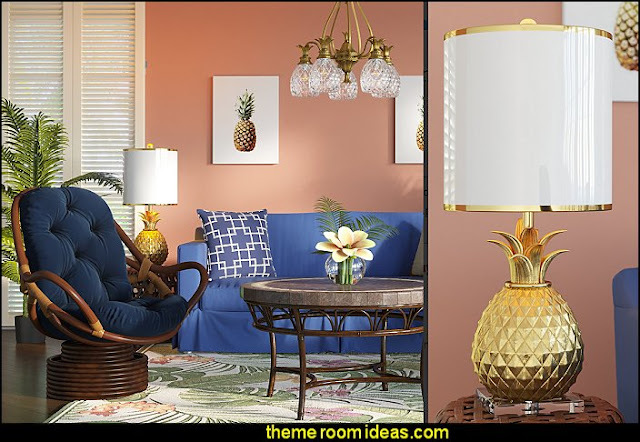 Lend a splash of island-inspired style to your bedside table or foyer console with this chic lamp, showcasing a classic drum shade and a chic gold-hued pineapple base. 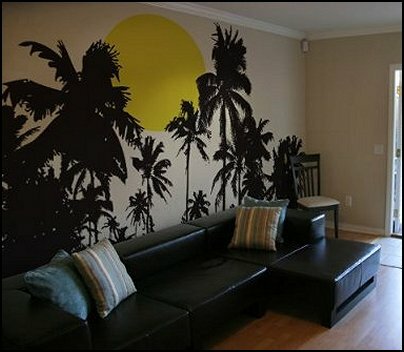 With a surprise behind every leaf, this scenic wall mural lets you enjoy the spectacular view of a tropical rain forest. 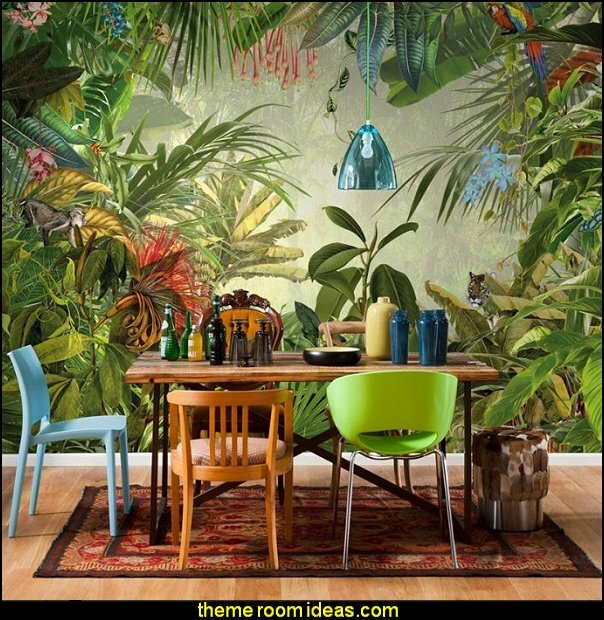 Watch tigers, parrots and other exotic creatures in their natural habitat, all from a safe distance of course!. 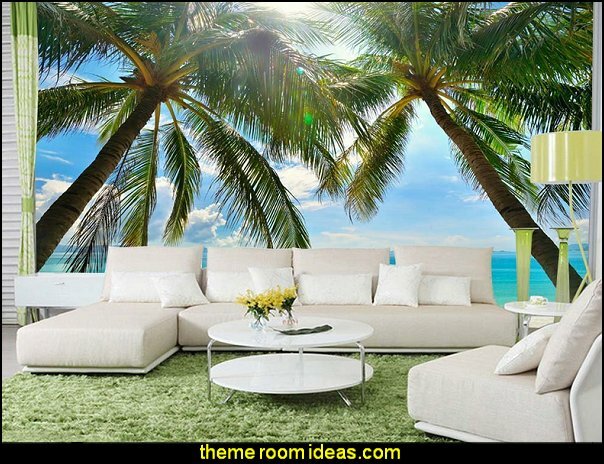 .... sooooo the next best thing .... create paradise in your home! 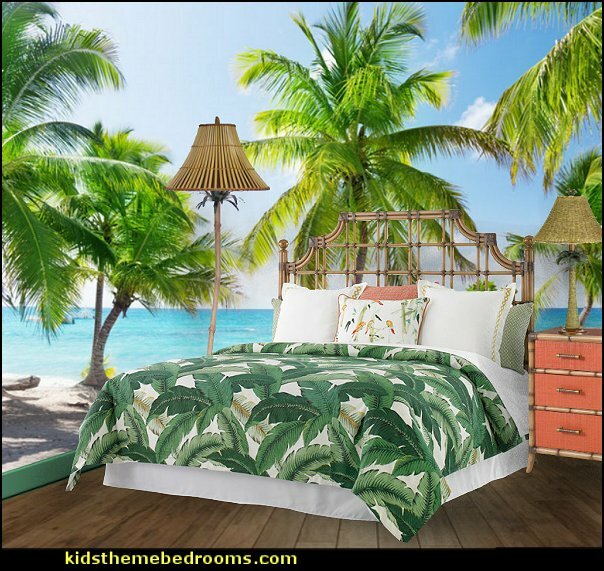 Transport yourself to another place without leaving the comfort of your own home with rattan furnishings and the cool colors of the sea - who needs to spend money on actually going to tropic beaches when you can just go to your room? 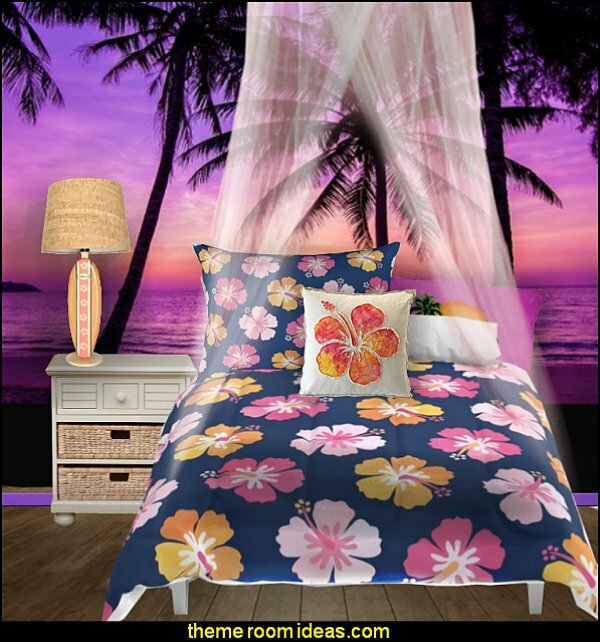 Bring some Hawaiian island serenity to the home or bedroom. 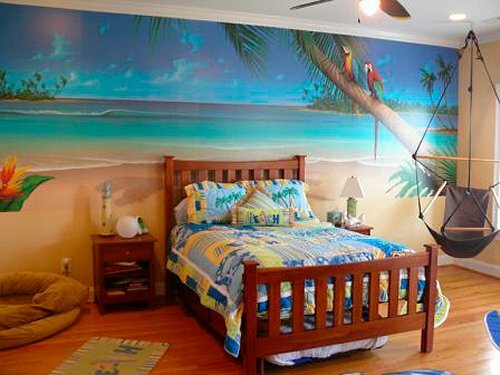 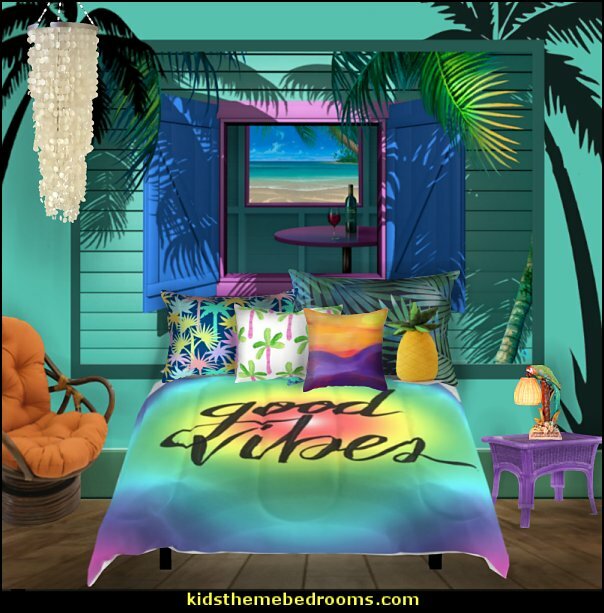 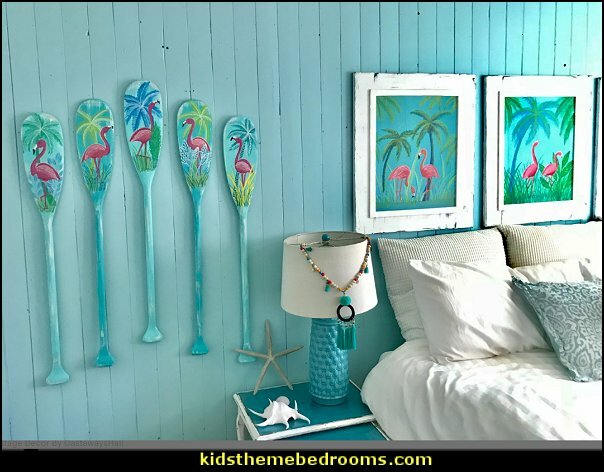 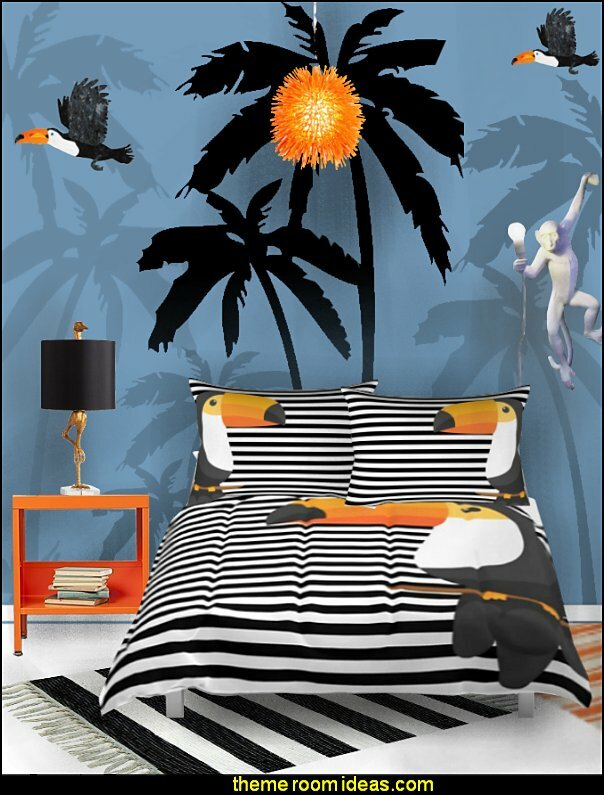 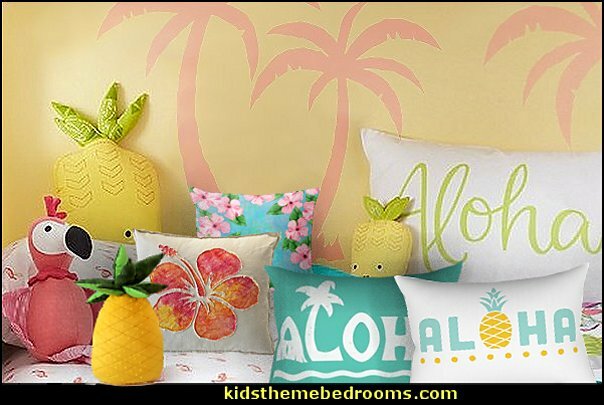 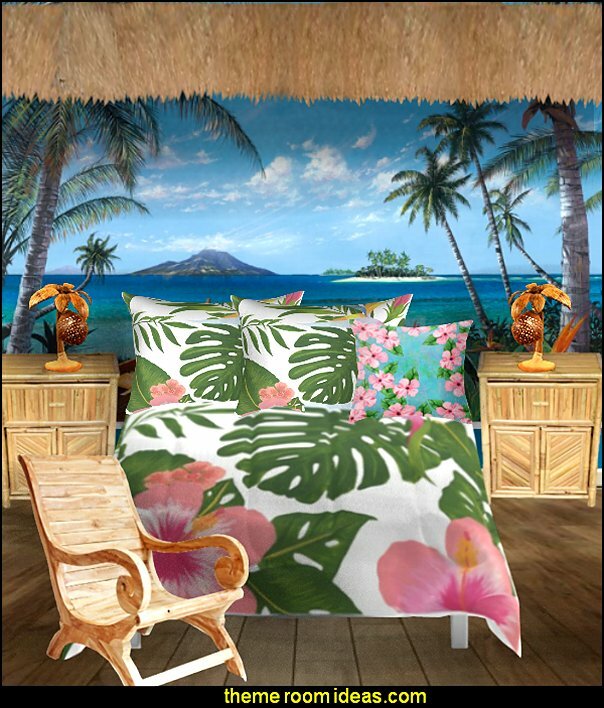 Create your own unique look and use your holiday snap shots as backdrops in your tropical themed bedrooms with made-to-order murals. 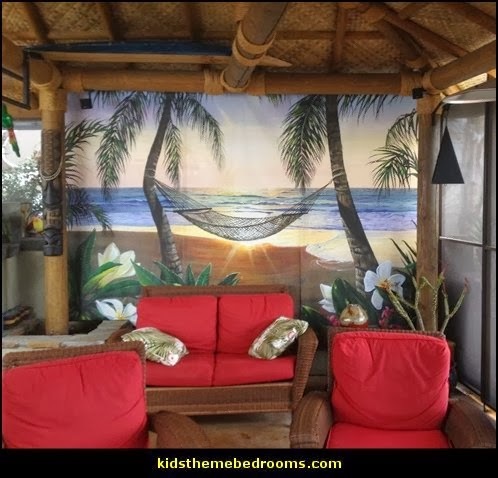 Create a mural your way! 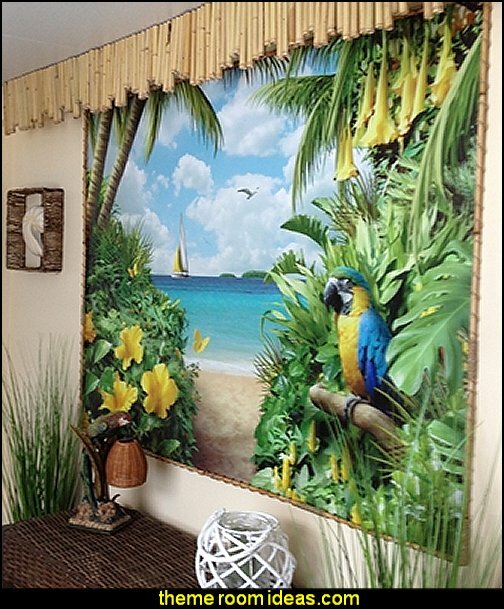 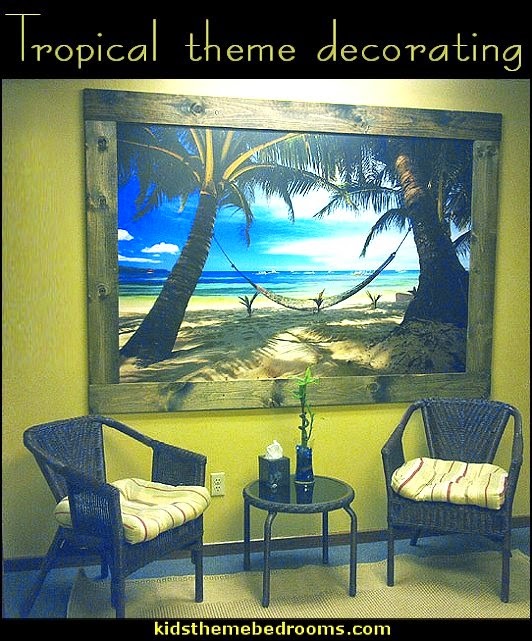 Create a fake, yet calming and beautiful, window view with your tropical wall mural. 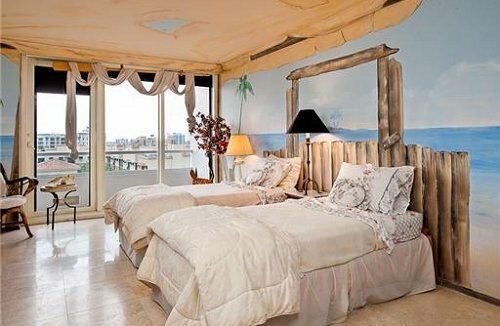 By the time you finish the room, you'll be able to smell the sea air. 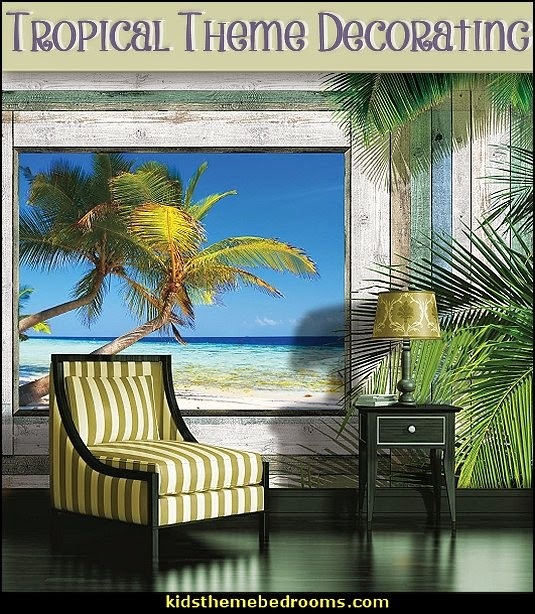 Get creative with your wall murals as window decorations. With a little imagination, this idea can work for any decorating theme. 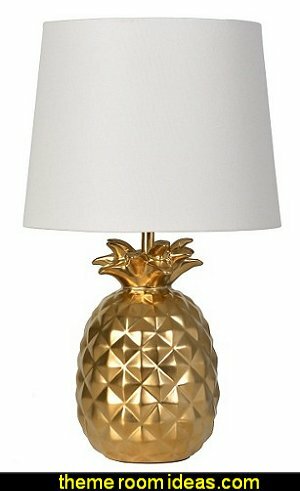 It'll definitely trick your friends! 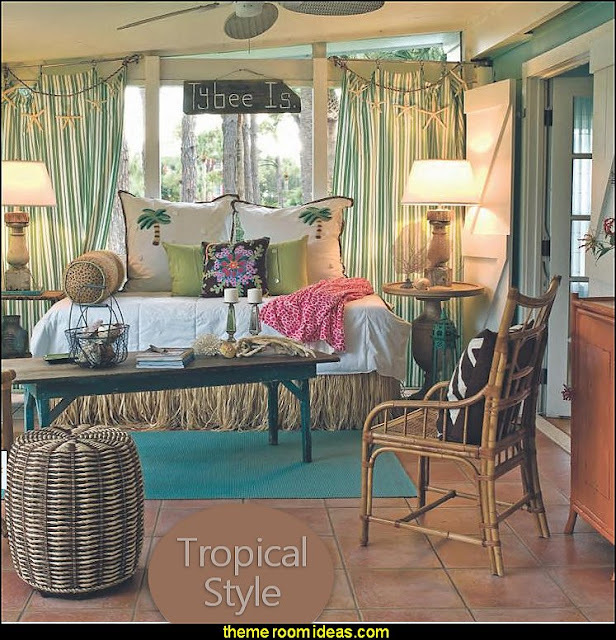 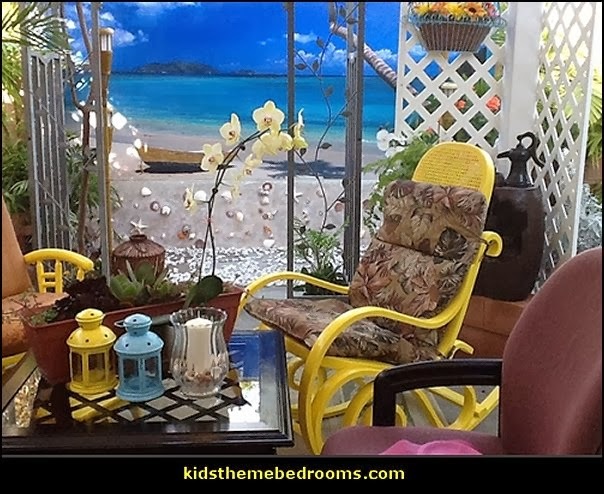 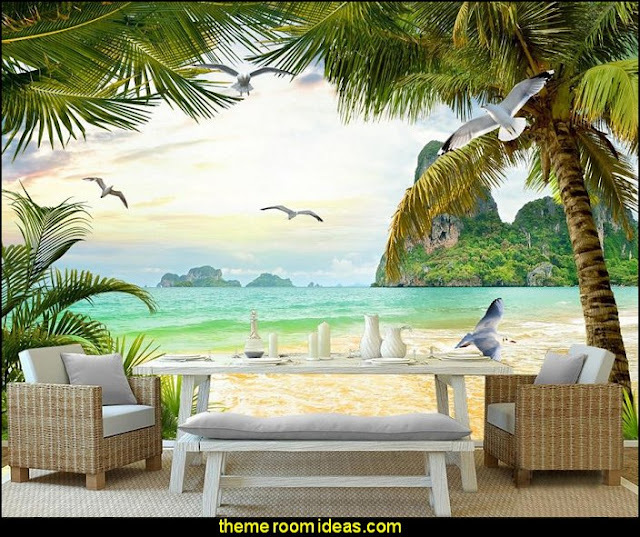 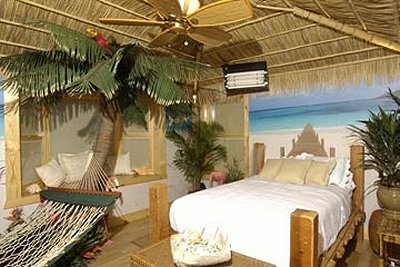 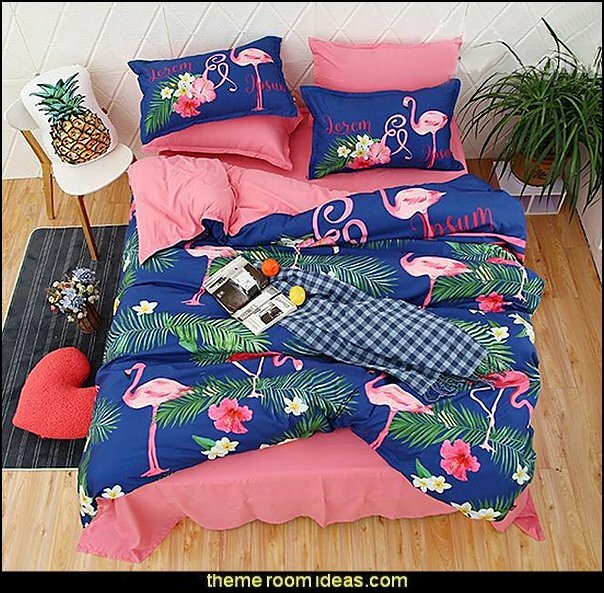 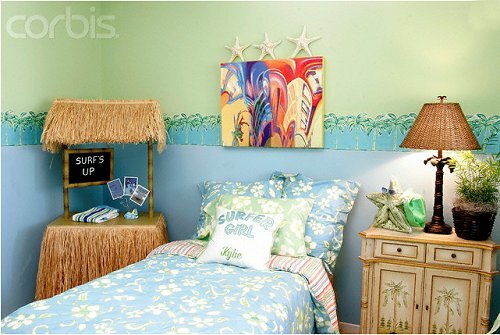 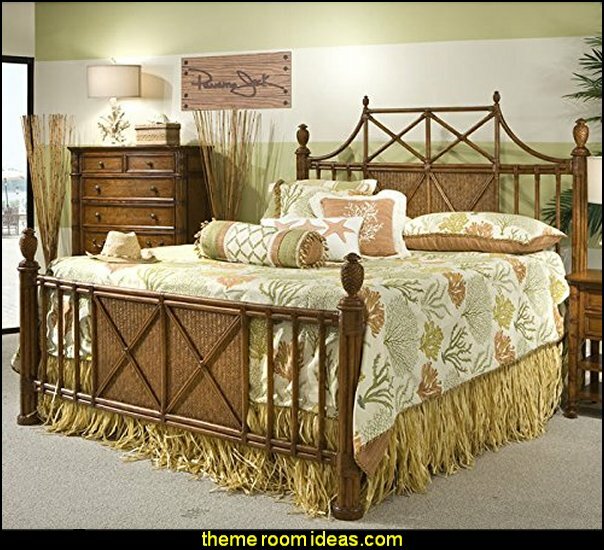 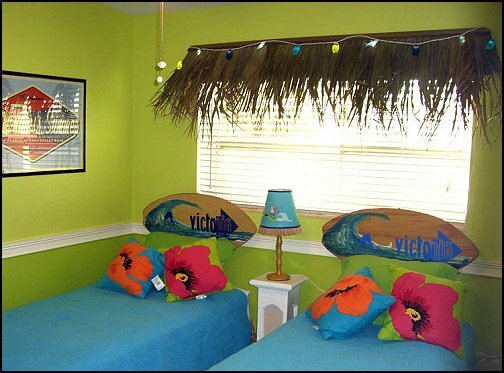 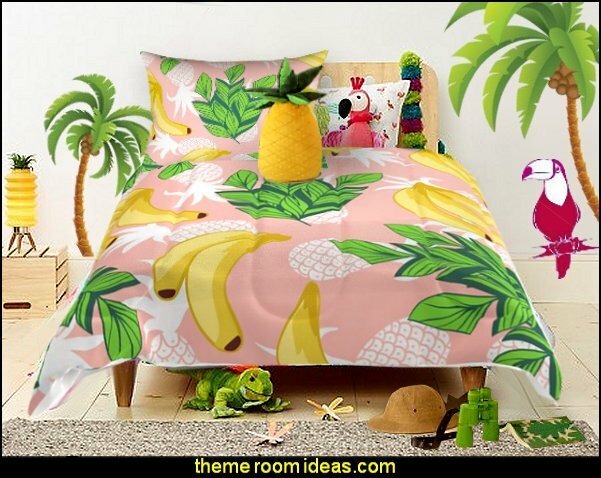 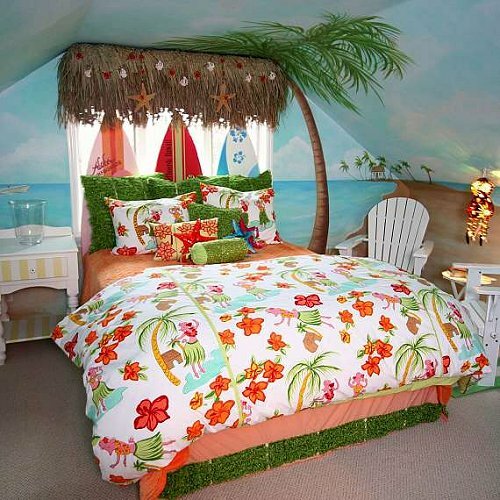 Tropical beach and resort style bedroom ideas are a great idea for teen hangout spaces! 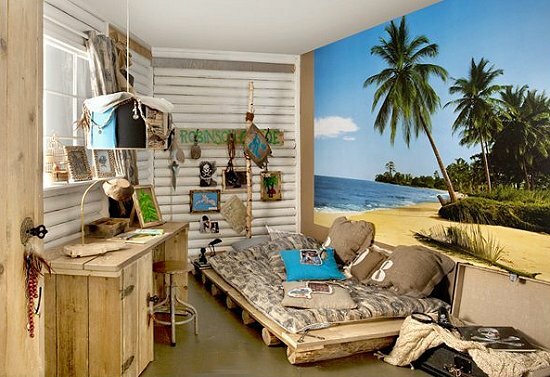 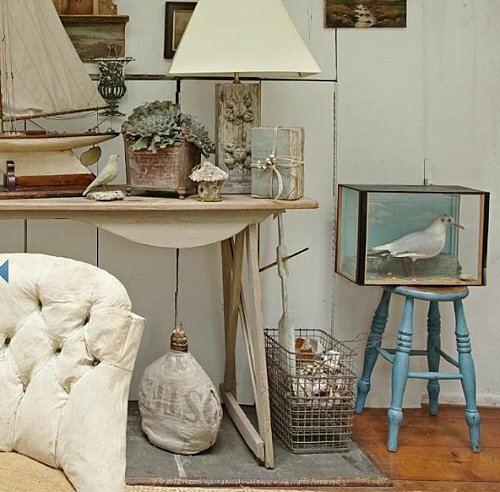 Bring the beach indoors. 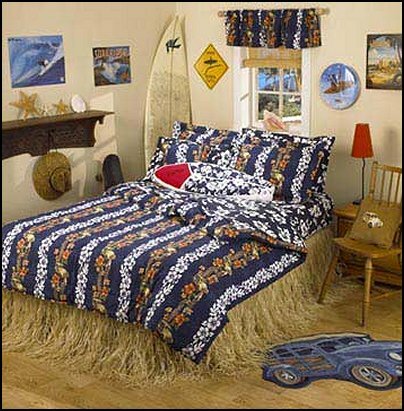 Accessorize with surfboards, raffia, fish and tropical flowers. 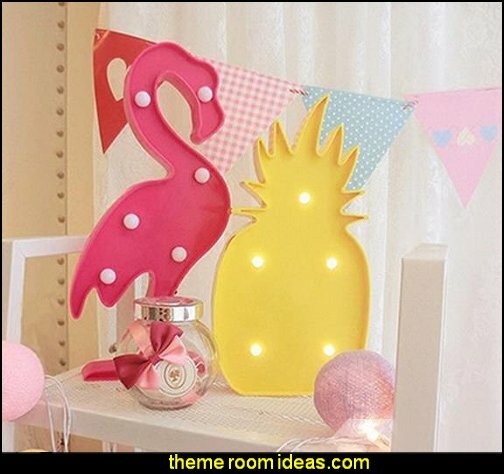 Great theme for boys, girls and teens of any ages. 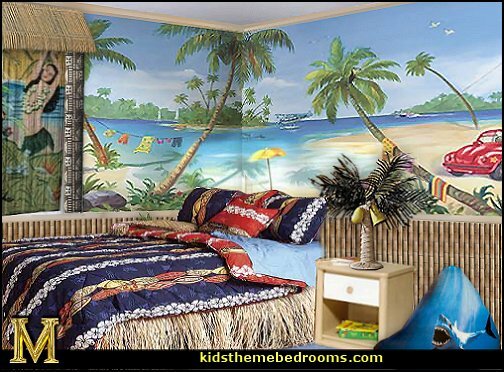 With scenery like this, they'll definitely be entertained during summer break! 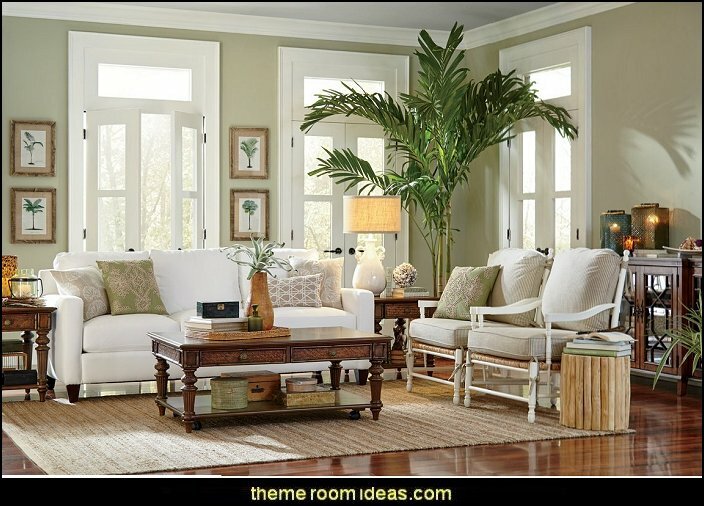 Antique whites and soft blues create a warm coastal living room picture. 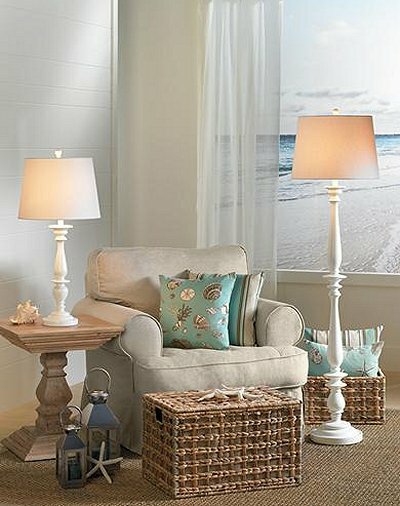 Light beige woods, antique white paint, and soft shades of aqua and blue work together to create a harmonious coastal living room picture. 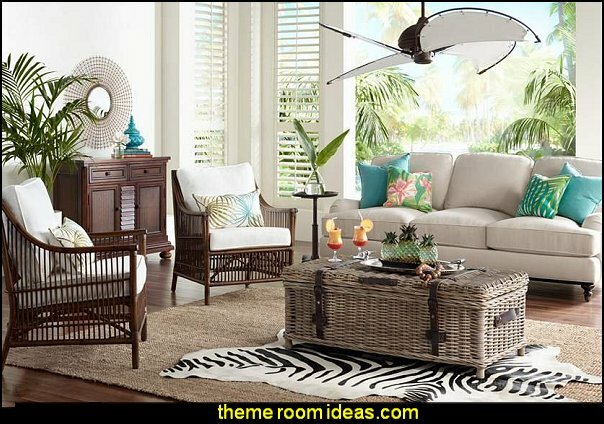 Texture also plays an important role in creating a cohesive coastal look - the woven rattan baskets and coarse sisal jute area rug give the space a beachy, natural feel. 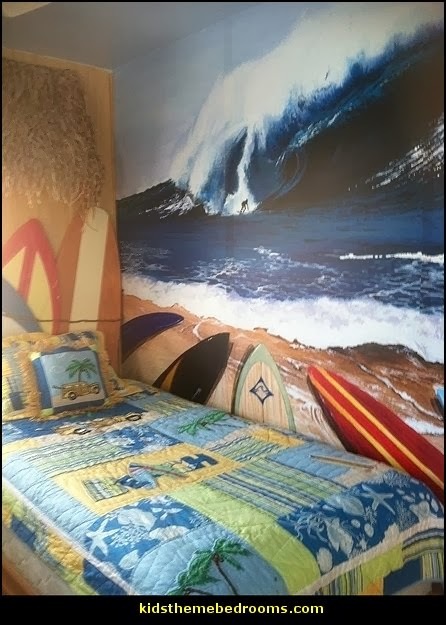 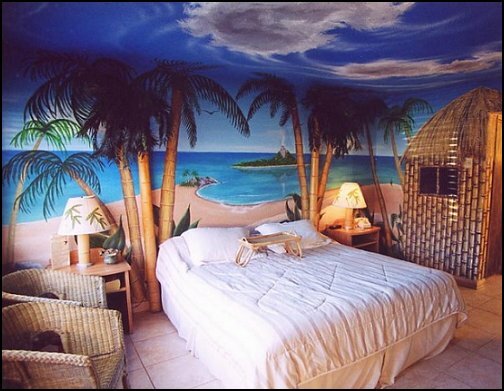 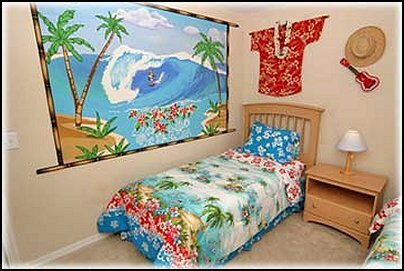 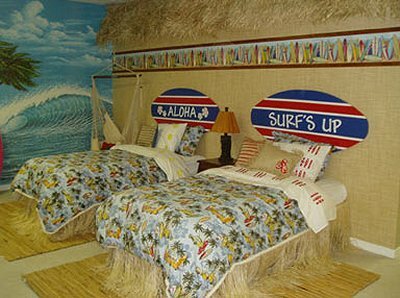 boys surfing safari themed bedrooms. 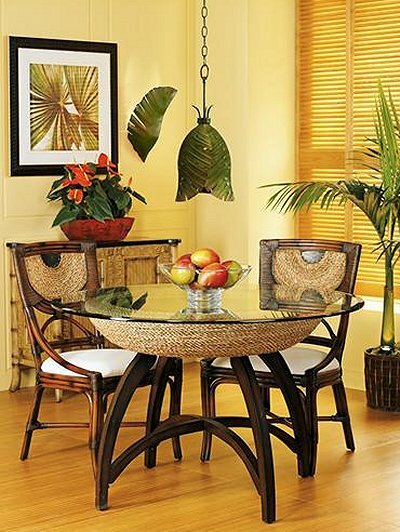 Leaves and ferns create a warm coastal ambiance in this dining room. 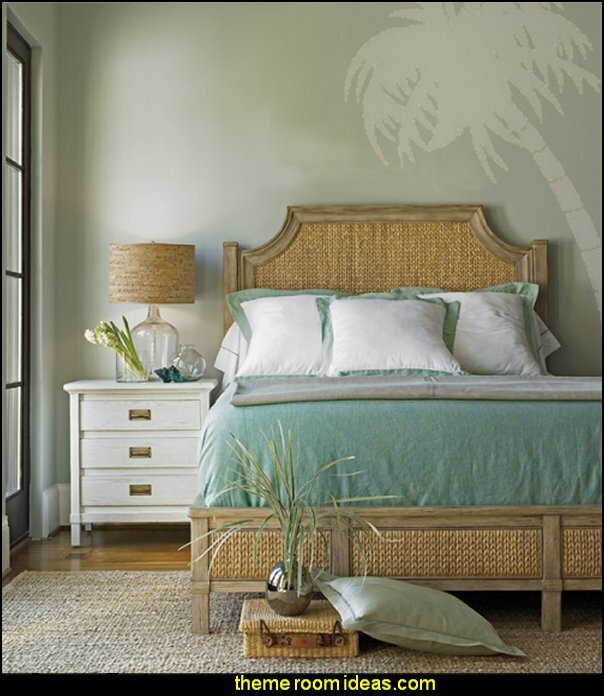 Natural textures and finishes are the essence of coastal design - think leaves, ferns, rattan, and wicker. This dining room exudes a relaxed coastal feel with its unique lighting - these banana leaf-shaped wall scones and pendants are a must-have for any coastal inspired space! 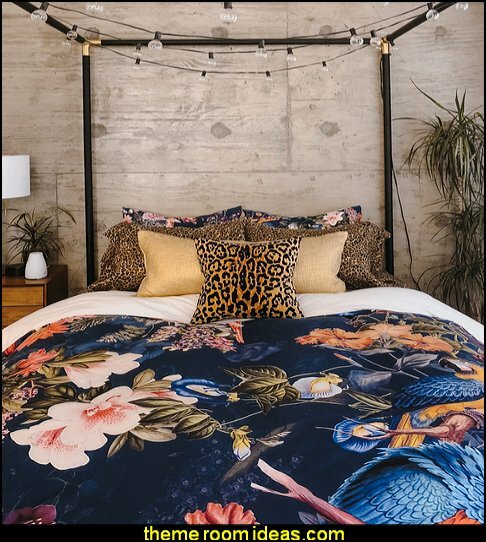 where would we find the blue flower quilt and the other items in the photo? 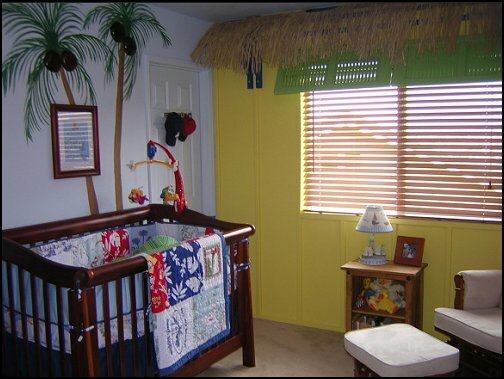 I would like to know where I can purchase the raffita valance that is shown in the hula poodle photo.